Bespoked is back in Bristol! 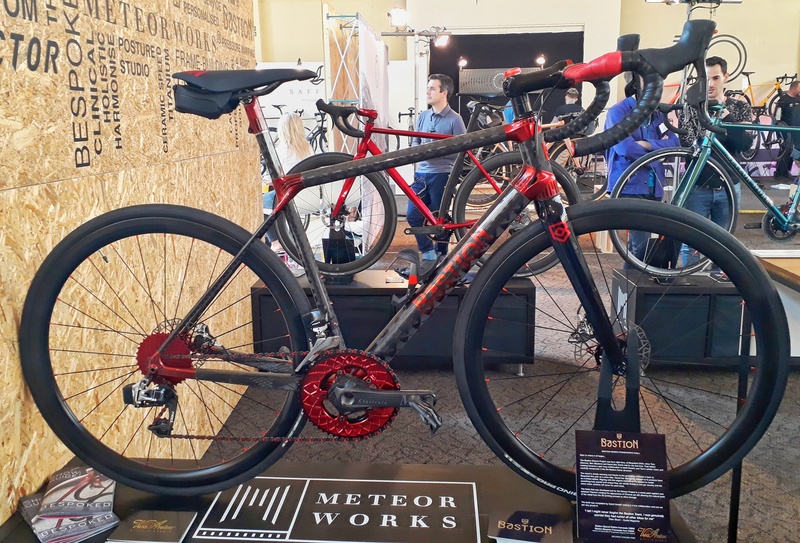 Brainchild of Phil Taylor, himself a passionate frame-builder and cycling fanatic, Bespoked is the UK’s premier handmade bike show. Nowhere else will you find a finer collection of customised beauty, lugs, plaid shirts and well groomed moustaches. Too good an opportunity to miss, we got hold of some cheeky press passes and drooled over some of the finest bikes in the world. Here’s a selection of our highlights. One of our personal favourites came from Mercredi Bikes. Adeline started frame-building a few years back, creating her own ‘cross bike after being frustrated by stock efforts. 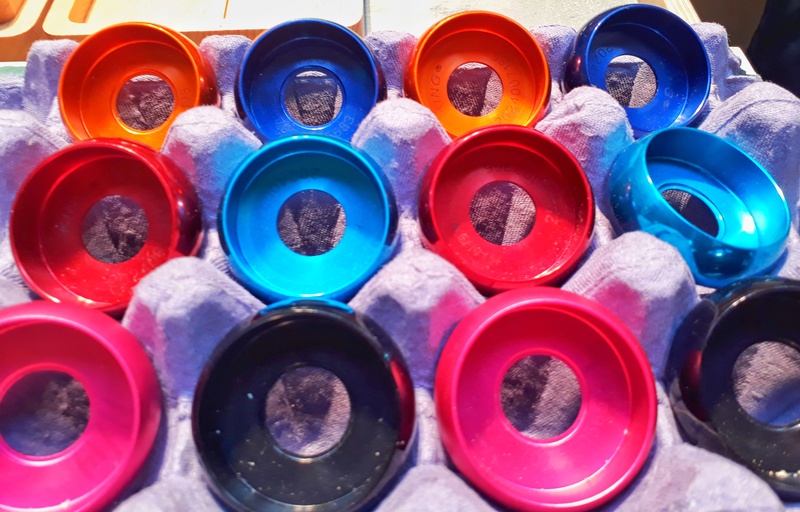 She now has a whole team rolling on these jazzy numbers – which include custom Fabric saddles – and she has mastered the art of churning out frames in batches to keep costs and delivery times down. Also on display was Andy’s custom 29er, which looks like a right hoot to ride. We love the adjustable dropouts for single-speed conversion, or lengthening the stays for bikepacking. Keep up the good vibes, Adeline! This absolute stunner came from Weld One cycles, a Japanese frame-builder with an eye for detail. Note the cherry blossom anodising on the top tube and the custom titanium bars. Also, custom titanium discs. Oooft. Isen cycles is a partnership between the already excellent frame-builders Caren Hartley and Matt McDonough. You may be familiar with Hartley frames from Juliet Elliott’s Redhook Crit machine. We love the custom paint jobs on these race bikes for their sponsored crit riders, especially the build with a 1x XTR drivetrain and Lightweight Meilenstein wheels. We’re also huge fans of this tiny 26″ wheeled randonneur bike, built by Caren for an extra petite customer. Bespoked has an entire section dedicated to new frame-builders. We particularly liked these offerings from Himalaya cycles – their first two frames. Ismail started out as a mechanic before creating his own frame for touring. Also on show was a rather lovely gravel build. Not at all bad for a first attempt! 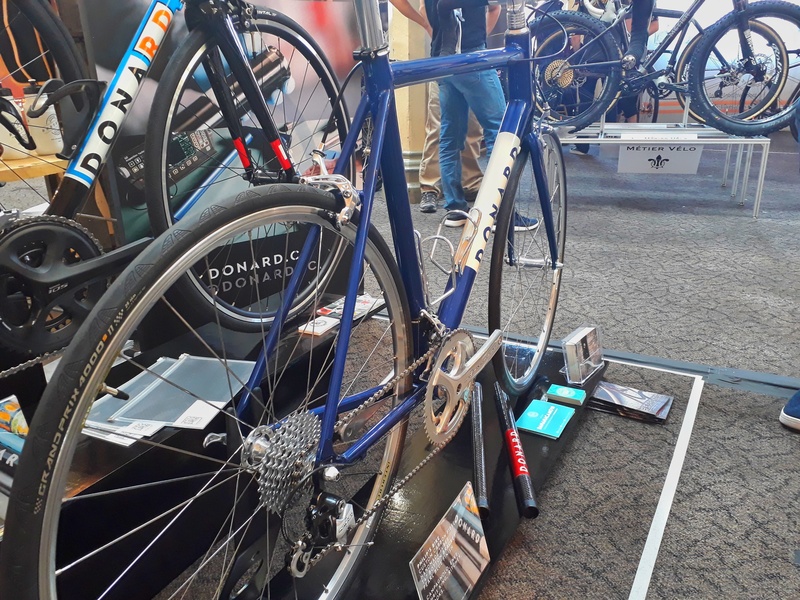 Donard bikes are based in Northern Ireland, and offer a selection of custom steel and carbon frames. Owen spent some time riding for our very own Bristol Road Club a while back, hence the marvelous steel race bike in BRC colours! We’re also fans of the classic look of this customised carbon build – which he had made specifically for his at-the-time unused silver wheels and groupset. A fine excuse to order a new frame if ever we’ve heard one. Owen builds all his carbon frames completely from scratch using pre-preg carbon sheets, which gives him complete control over the ride characteristics. Portus’ excellent Black Forest Trail bike caught our eye quickly. 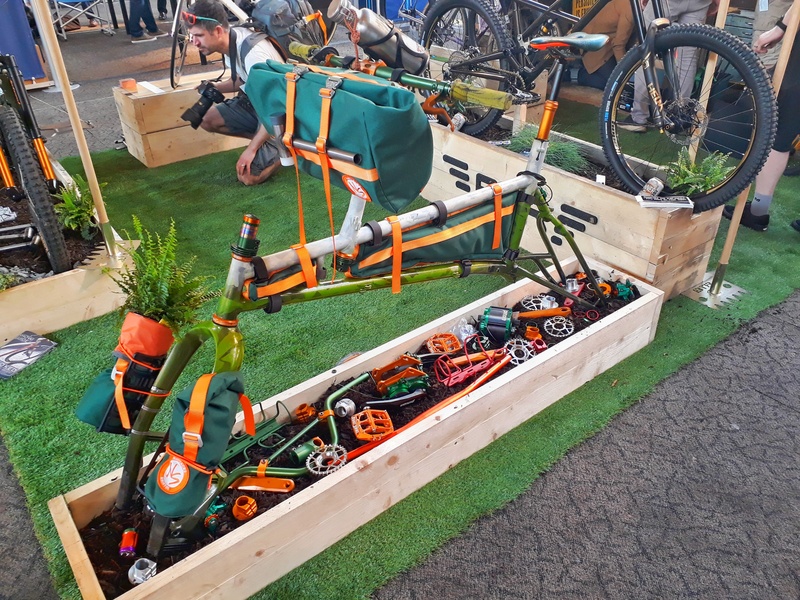 It carries everything a bikepacker could possibly need: BBQ, chainsaw and a bottle of Jagermeister for those chilly evenings. It’s kitted out to lug any amount of kit over most terrain, and look like a beast doing it. Maybe we’ve been doing this bikepacking lark all wrong! Demon Frameworks came with this number, all in gold and amber glitter. It might help keep you visible, but it could never be called ‘subtle’; indeed, it’s almost the definition of a statement bike! Pi Manson of Clandestine bikes was showing off this fabulous tourer/commuter setup, complete with custom-made stem and braze-on bell mount. We particularly appreciated the provision for chunkier tyres (it’s on 42c at the show) and custom cabling for integrated lights. We’d certainly love a stylish and practical workhorse like this! 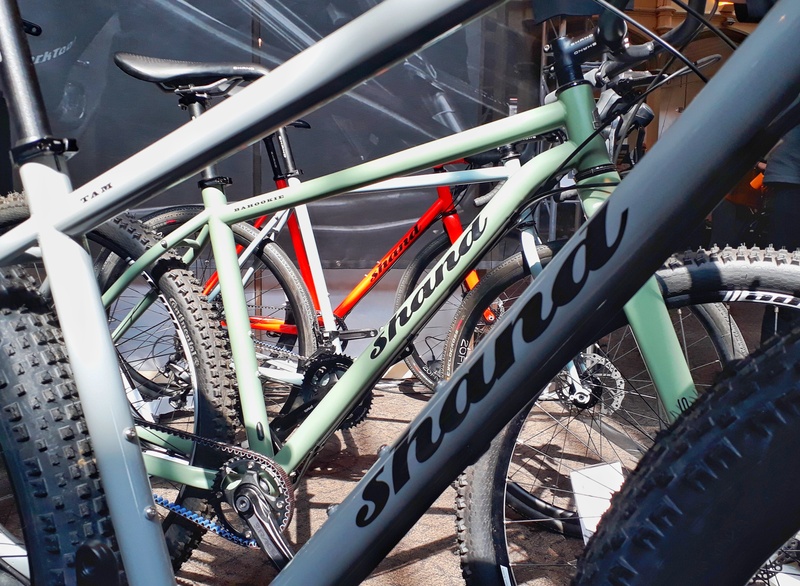 Scottish builder Shand had a whole fleet of bikes on show, mostly at the gravelly end of the spectrum. We think their 29+ Tam might be the ultimate off-road bikepacking setup. Also on display was Jenny Graham’s custom frame for her upcoming round-the-world record attempt. Jenny hopes to break the current record of 110 days unsupported. We certainly wish her the best of luck on her epic ride! Woodrup Cycles had a selection of bikes on display, but this Reynold’s 953 stunner caught our eye. Chatting to the builders (3rd generation Woodrups, keeping it in the family!) 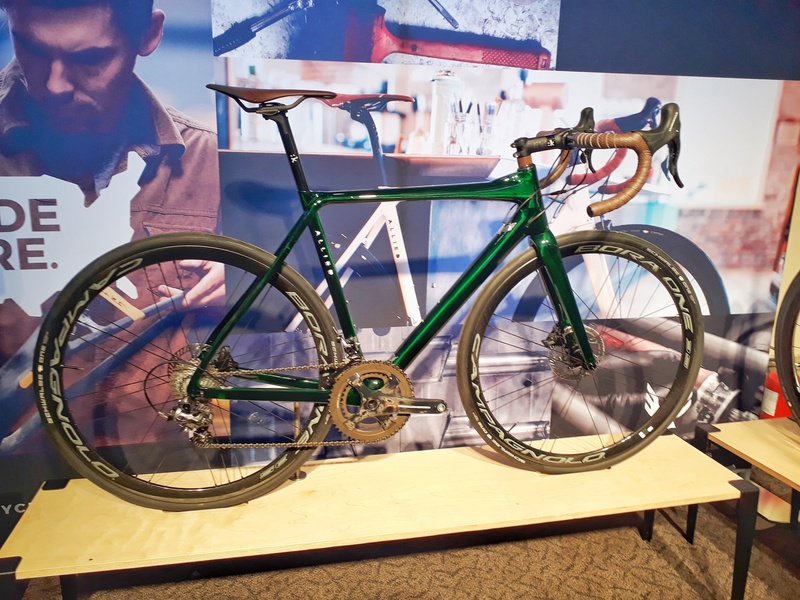 we learned that every aspect was customised – down to the owner’s family crest etched into the lugs, and their name in Morse code hidden as bar tape perforations. The bike had just come back from being ridden on the Paris-Roubaix sportive, proving that beauty and function can be one and the same. One of our absolute favourites. Bristol-based Flightrider saw the problem of sourcing bike-boxes while touring and developed an elegant solution. 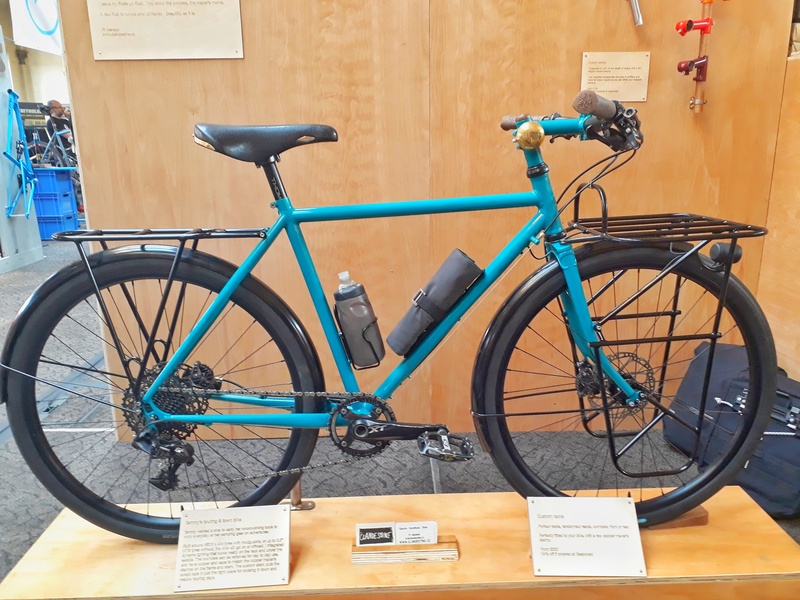 Their padded bike-carrier folds to form a fetching pair of panniers for use while touring, and removes the stress of repackaging your bike for the return journey after an international adventure. Currently they’re still in beta-test, so watch this space for more. ColourBolt’s stealth-black, textured, belt-drive single-speed ticked all the hyphenated boxes of Radness. We particularly liked the elegant solution to the need to split the frame to remove the belt. It looks like a seriously fun yet practical bike for razzing around a city. The textured anodised matte finish is a nice touch. We really, really want one! You know a bike is pretty badass when it comes with a smokescreen. BTR had this custom painted Pinner on display. We love the metallic gold flecks in the paint matched with the anodised gold components. 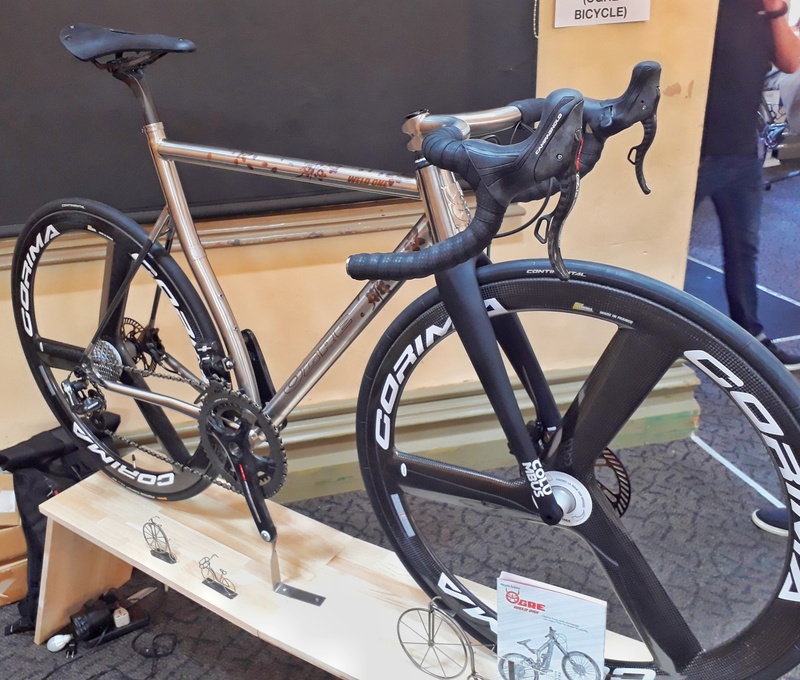 US carbon specialists Allied teased us with rumours of a new release before the show and they didn’t disappoint, revealing a disc equipped version of their Alpha road race frame. The stunning green finish and Campag Super Record discs get a thumbs up from us. Bastion produce stunning road frames with carbon tubesets and 3D-printed titanium lugs. 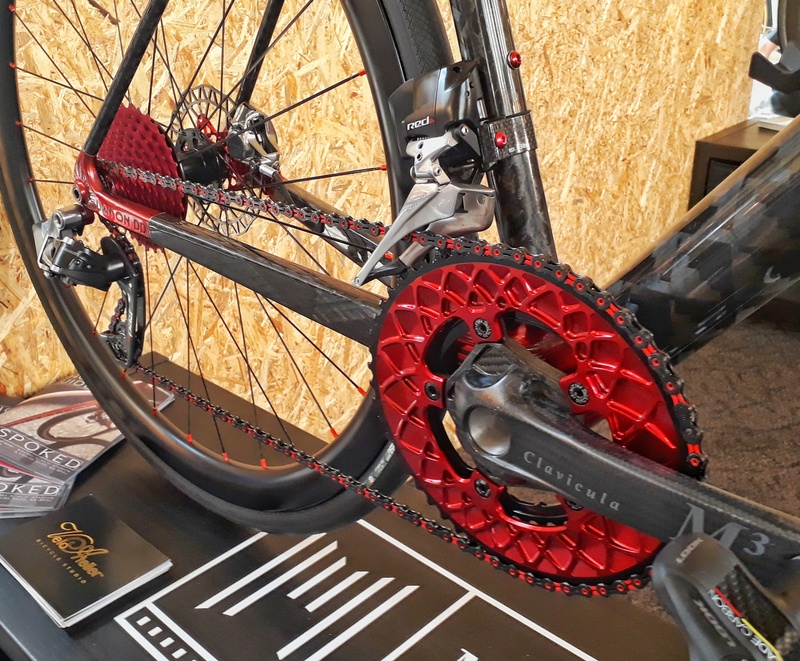 This beast stole the show, with Sram Red Etap, red anodised lugs, cassette and chainrings, and ultralight THM Clavicula cranks. Made of pure unobtainium. No, we’re not sure either. We had an absolutely cracking time at Bespoked, and we urge you to visit if you can. It’s far more than a collection of bikeporn to gawp at – it’s all the very best bits of the cycling community under one roof. 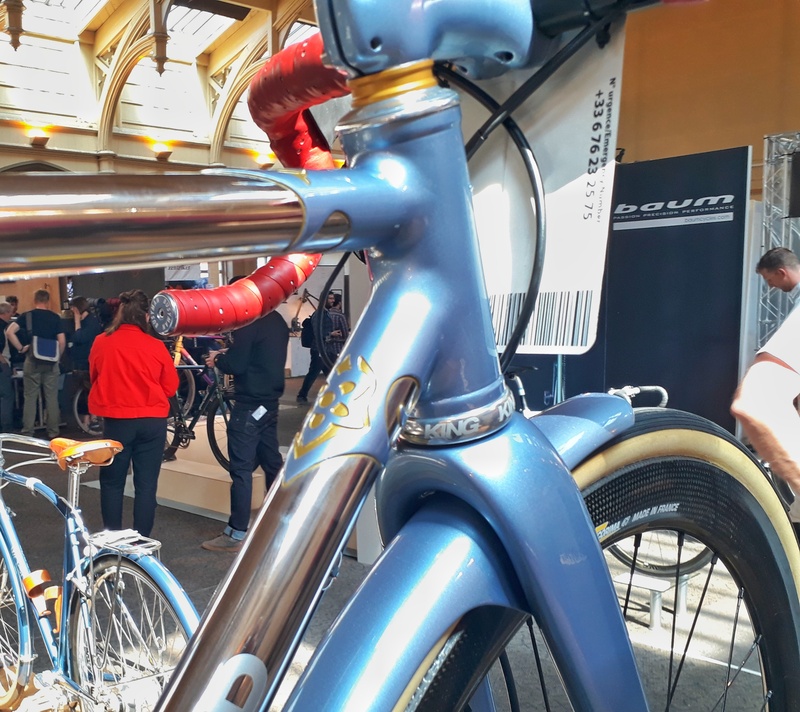 We loved chatting to all the creators of these masterpieces, who share our passion for cycling: they manage to use their work to seamlessly combine functional engineering and art. I think one day we’ll both be parting with our cash for custom beauties! Follow our rides and join the club at N+1. The N+1 cycling blog by Frederick White and Thomas Sharp is licensed under a Creative Commons Attribution-NonCommercial 4.0 International License.